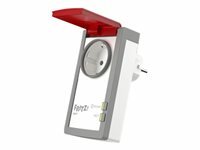 FRITZ!DECT 210 enables clever switching of the power supply to connected devices, and also lets you measure, record and evaluate their power consumption. The integration in the home network via DECT-ULE radio transmission is securely encrypted. And thanks to the splash protection, the smart plug is suitable for use in the bath and outside.